Any SMS gateway/API can be supported. SMS support can be also disabled. You can use any available stands in your area – we recommend any U type bicycle stand (alternatively, rails or lamp posts are usually good as well). Stands should be placed in well-lit public locations. Additionally, stands under private or public cameras are specially recommended (if anything happens, you have video evidence). Sturdy U-locks are recommended (with four digit code requirement). We recommend using only well-tested strong locks from known producers. The locks are most important theft-prevention feature (in addition to the well scouted stand location). User receives a four digit code (via web app or SMS) to unlock the selected bicycle and then is required to change it to the new preselected code. Credit system works, users can be given coupons of selected value to redeem. Paypal/Bitcoin payments will be implemented later as well. How the sistem works to avoid robbery? We are using sturdy U-locks and recommend to use stands around the city that are well built (e.g. bicycle can be locked to it through its frame, not a wheel). Also, we scout secure locations – e.g. those close to places where lots of people walk every day (e.g. near building entrances) or places that are under camera (banks, post office etc.). What happens if the user makes a mistake and it doesn’t change the code to the correct new preselected code? If they recognize their mistake, then can go back and reset it to the new code. If they don’t, new user tyring to rent can report the issue with the code and one of the repair guys will stop by and fix it. Some priviliged users have also access to the code history and can therefore reset the codes. Otherwise, if there are multiple bicycles at a stand, you can rent another one. You will receive a notification that can be set up via SMS. Alternatively, you can just open the admin and get the fleet overview. Also, once credit system is enabled, you limit usage by setting higher costs for longer rentals. This way, you need to sell prepaid credit with some deposit taken. If a person hires a bike for 5 hours, but they return it after 8 hours, how do you know? What if the user does not return the bike is there a system in place to recover the cost of the bike from the user? sorry for the late reply. Credit system allows you to keep set amount of money blocked in the system, also we recommend some kind of contract to be used for new members, so liability is clear. Hi guys, I like what you are doing! If the person that hires the bike returns it to a specific stand but does not secure it with the lock (either accidentally or intentionally) thereby relinquishing their responsibility for the bike because it would appear that they had returned it. However by not locking the bike they would have allowed another person to gain access to the bike. What is in place to prevent this from happening? Thi is the system that provide the software for you. It does not create any framework of use, which you are responsible for. In this case a contract could be signed when user is registered with a clause saying that user is responsible for locking the bicycle. 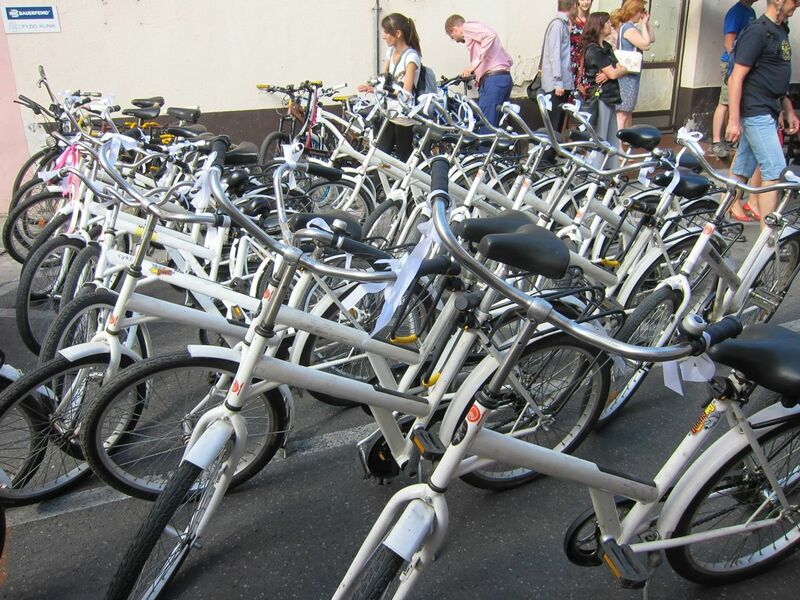 If bicycle is left unlocked and stolen, user can be sued for damages (or if you have credit system in use, you can disable the account and keep the credit for damages). One of the commercial providers required a copy of an ID for registrations in case of later bicycle damage or theft. What payment mechanisms or gateways are in place, I saw that there were plans to introduce PayPal , has this happened? PayPal is not there, yet, but on of the system operators is working on it. Currently, only out of system payments (cash or wire transfer etc.) are available. Once you receive money, you manually issue a credit voucher to user. Is there some form of tracking used to locate identify the specific available bike? if so is this located in the lock or attached to or hidden within the bike somewhere? No, as this would be battery-dependant. We have been testing Tile (https://www.thetileapp.com, but this requires enough passer-bys to be walking around having that app installed). Until battery is not an issue, it will be hard to have tracking system running for low-cost system such as ours. Hi, I will like more info. about the system. cost of the system ?. locks. , and sis you all ready have a system to bill a credit card? Credit card payments have not been implemented so far. I see te video, but I have other question ,, so the customer. is just one way. at the moment he look the bike . he can not use it again,, I mean . if he ride for 20minutes. stop in the supermarket. and do his buys. then to return he need to pay again.???. User can use the bicycle as long as he wants (or as the system allows him to without high charges, usually from 30 minutes to 3 hours). In the meantime while using the bicycle, he uses the lock as any other lock. He can lock the bicycle wherever as long as he assures its security. Afterwards, when user finishes, he can unlock it and return it to the nearest stand. However, we do recommend immediate returns instead of keeping bicycles for prolonged periods, if a stand nearby is available as this allows for higher turnover of bicycles and more free bicycles are available this way. Otherwise, you can influence length of rental periods by changing the system rules (credit charges). realy im intereted in the system , Im looking to instal it in a cuple of hotels. but what can be the best wey to do it and to bill the rent. by the day.. can you contact me direct. Can I use this system for a community bank? Like a banking system. The question is that I’m trying to connect a community to assign Digit-Codes instead of money or cryptocurrencies with total control from the people and total transparency of transactions. Depending on your conditions you can require a proof/photo of a bicycle return, user contract stating his responsibilities for stolen or lost bicycle or implement other measures to safekeep the bicycles (e.g. choose stands that are always covered by private or public cameras). User received code to unlock bicycle and new code to reset lock to. then how to know user lock bicycle with same reset code. what if user lock with another code? is any way to prevent this ? Are there any updates here? Has a payment gateway been implemented? In the new dev version there is an option to connect this.